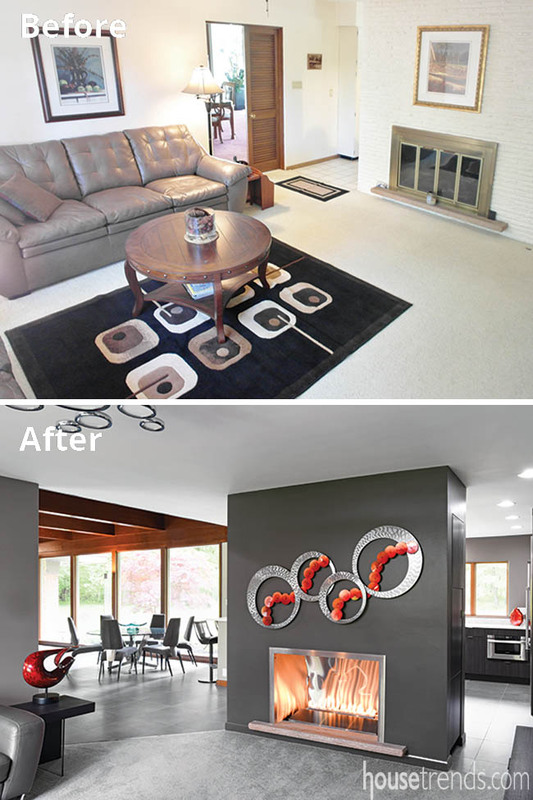 Splashes of redâ€”seen here in the furniture and various accessoriesâ€”add excitement to this remodeled home. 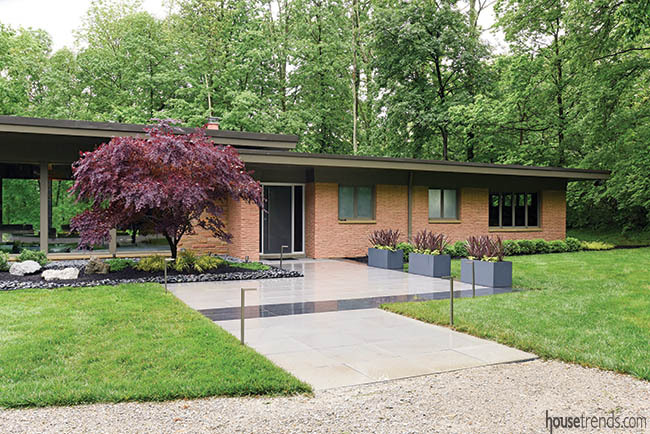 Faye Ledwick and Jeff Steeprow had long admired a house located in Washington Township, a mid-century modern ranch based on Frank Lloyd Wright’s architectural style. 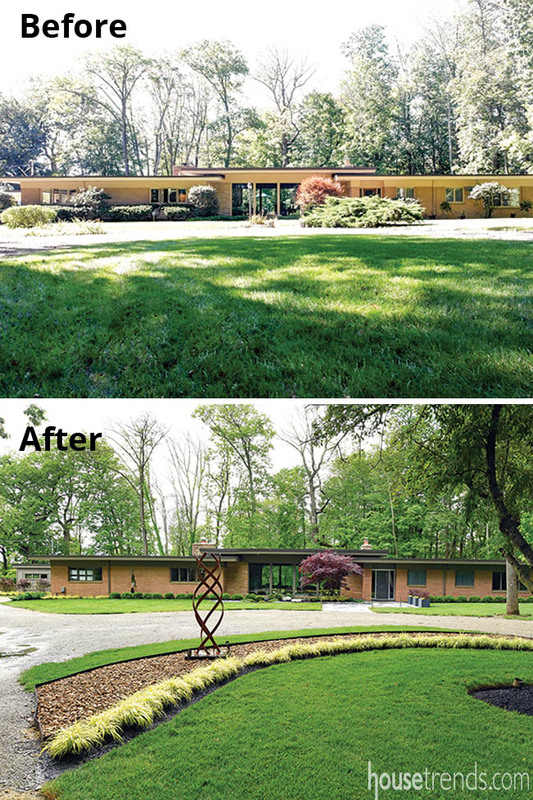 The home, built in 1955, was designed by Dayton architect George Gillespie for William Keyes. 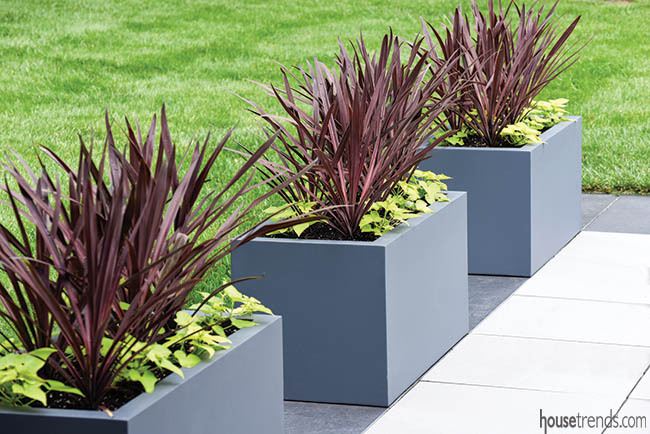 The look is based on Wright’s 1949 Usonian-designed Melvyn Maxwell Smith House in Bloomfield Hills, Michigan. 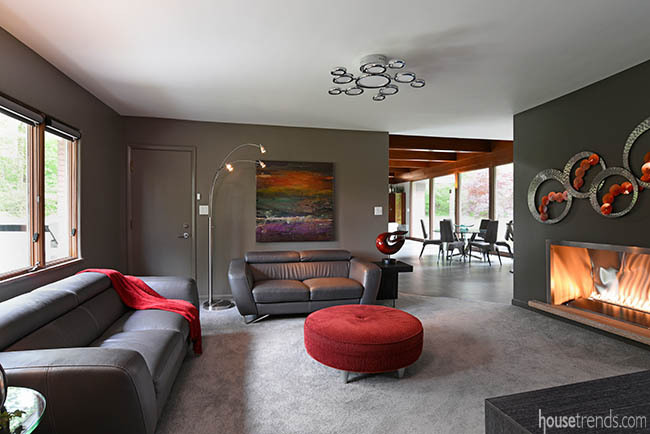 Horizontal roof places, cantilevers, an open floor plan, abundant windows and integrating the home with the landscape—all part of Wright’s style—beautifully come alive in this area home, now known as the Keyes-Ledwick House. 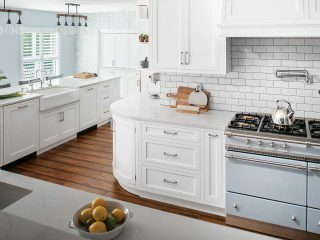 Faye and Jeff, who are empty nesters, took almost a full year to complete the oh-so-needed renovations in this 3,000 square-foot home. But that was a task perfectly suited to this talented couple, who can not only envision a new look, but also execute the plan. 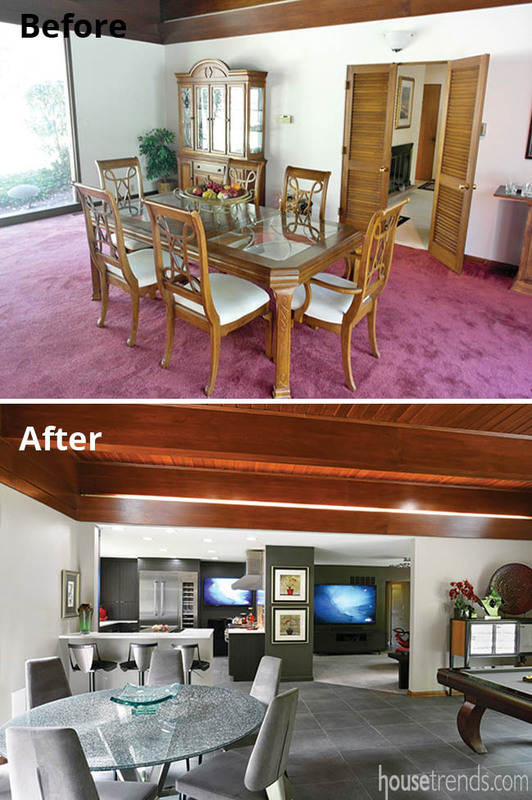 “Out” with rose-colored carpeting, stuffy furniture and ruffled valances and “in” with a clean and contemporary look as each room received a complete cosmetic overhaul. 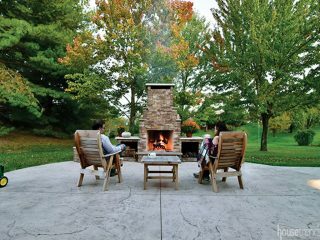 The couple turned to contractor Richard White of Centerville Building & Design for jobs that needed professional work. 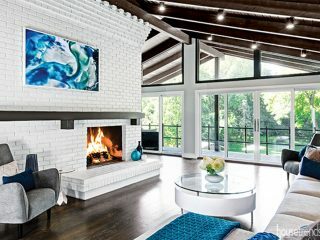 The “before” and “after” of the great room right in the center of the house shows the keen eye of the couple, an ability to use the good bones of a room—cherry wood 12-foot ceilings, open floor plan, floor-to-ceiling windows—and drop kick it into the 21st century. 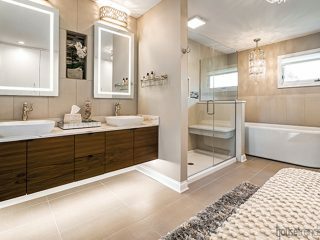 “For the flooring, we knew wood would compete with the ceiling so instead we chose a 24-inch porcelain tile with very thin grout lines,” says Jeff. 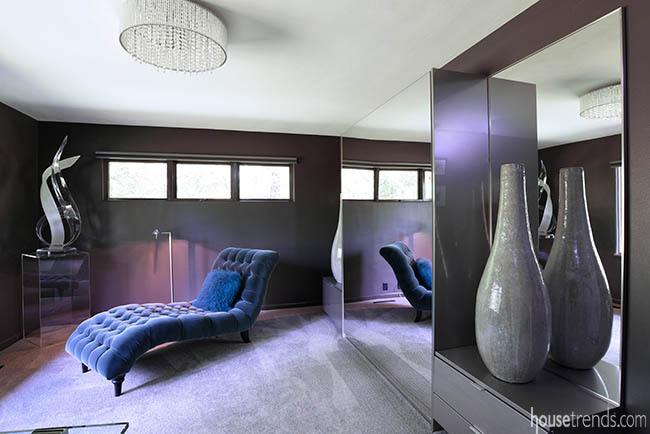 Incorporating a seating area, piano, pool table and dining space into one room is a bold move but the homeowners made it work. 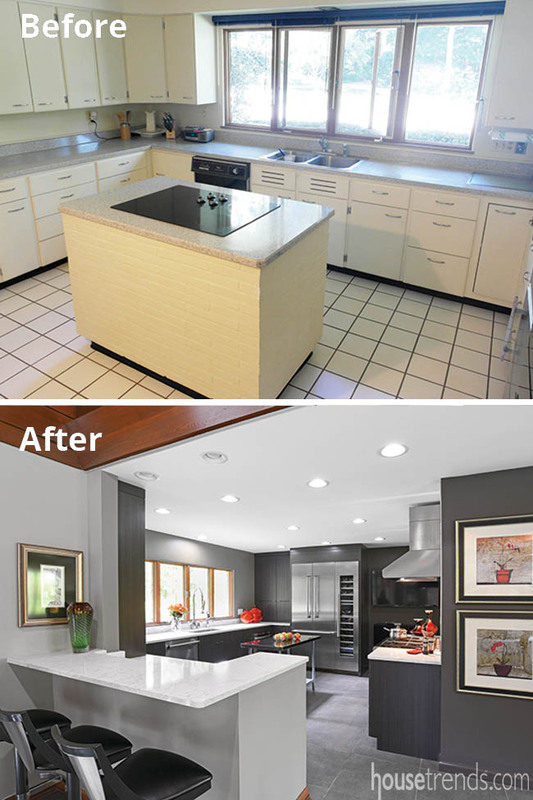 A wall between the great room and the kitchen was removed and the floor tile continues into this magnificent work center designed by White’s wife, Cynthia, a Certified Kitchen Designer. 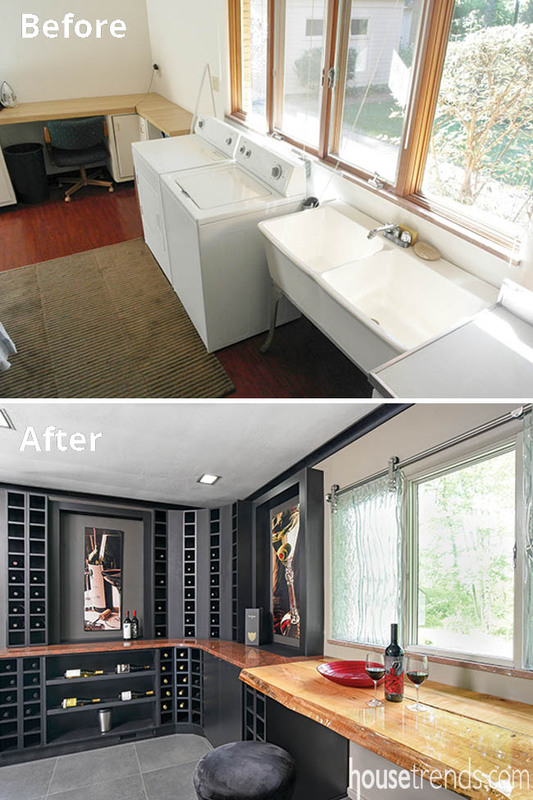 An especially fun update in the Keyes-Ledwick Home is the conversion of the laundry room to include a wine room. You’d never know the washer and dryer are walled away at one end of a charming wine room with splendid built-in bottle racks, a live edge wood countertop, and sliding slump glass window coverings. 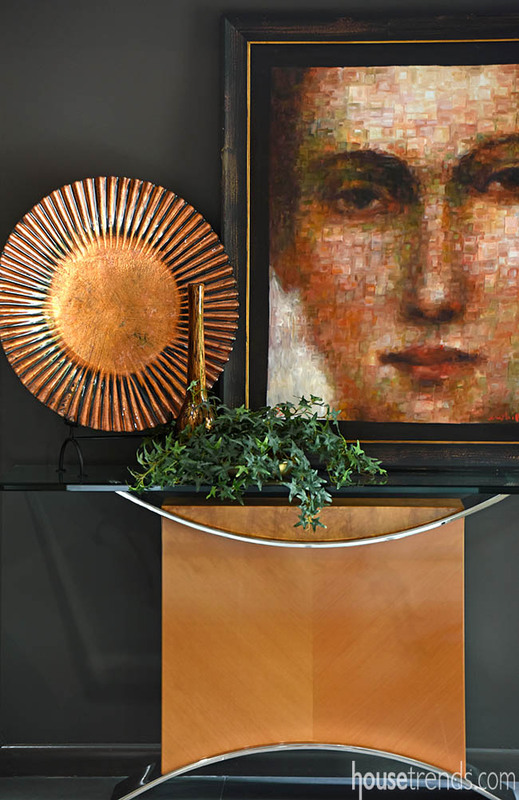 For the truly sensational master bedroom, Faye and Jeff asked Julie Cochran of Decorating Den Interiors in Centerville for an extended leather-look headboard that also serves as the backdrop for end tables. 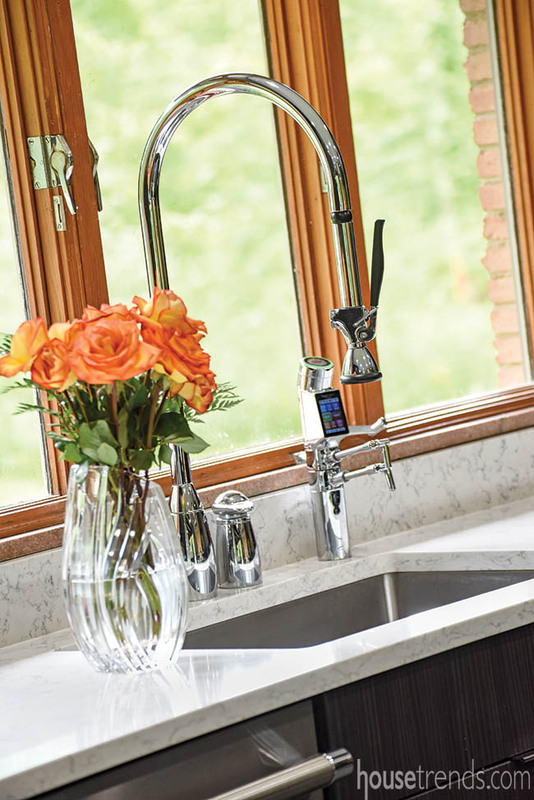 “Faye had seen the idea in a magazine and knew it would work in her new home,” says Cochran, who has worked with the couple on many previous homes as well. 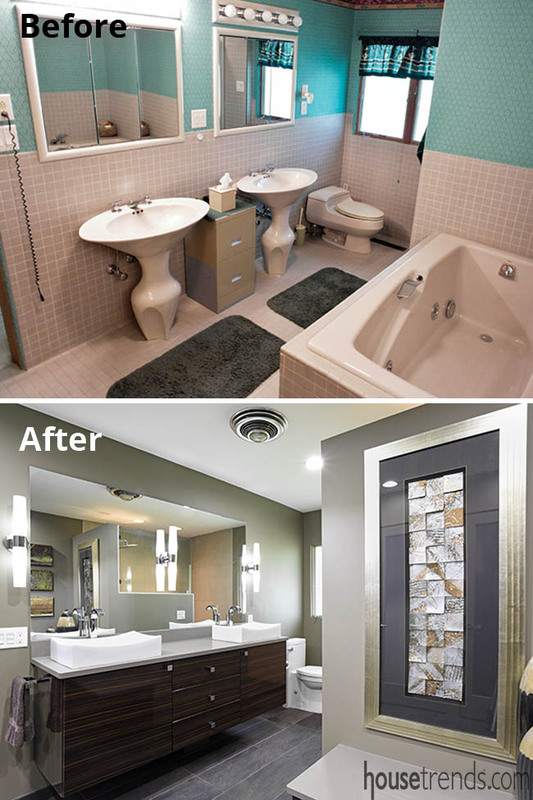 Describing the change made to the master bathroom as “dramatic” is a huge understatement. 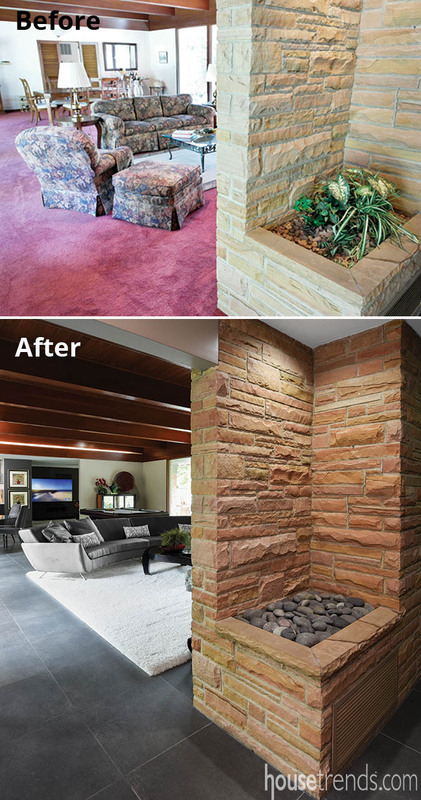 The 1950s room of pink tile, tub and toilet and green walls was transformed into an upscale cool and contemporary brown and beige retreat. 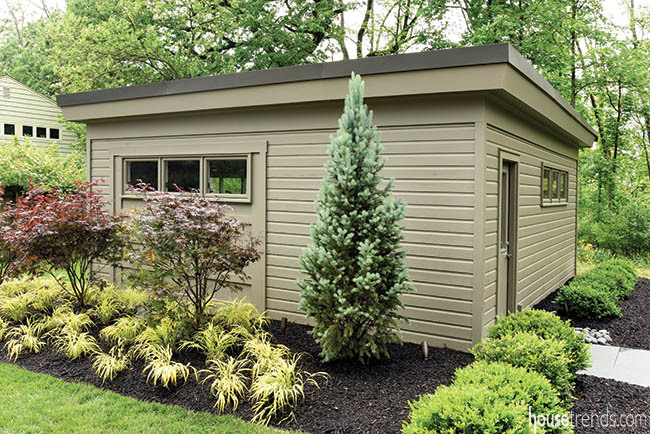 Adjacent to the bathroom was a 12-foot-long closet but with a small door. 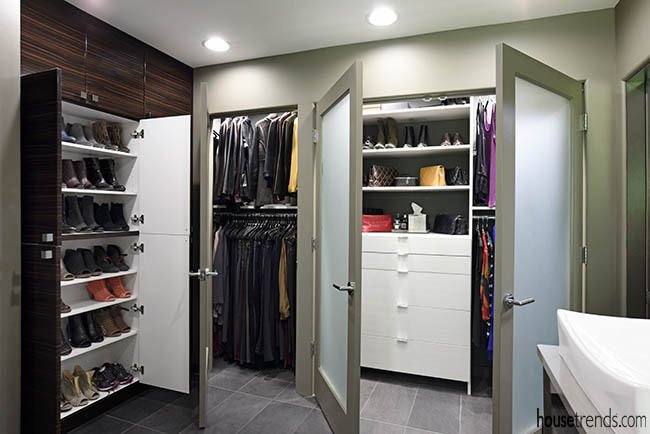 Centerville Building & Design added double doors and converted an adjacent alcove into handy storage for shoes. 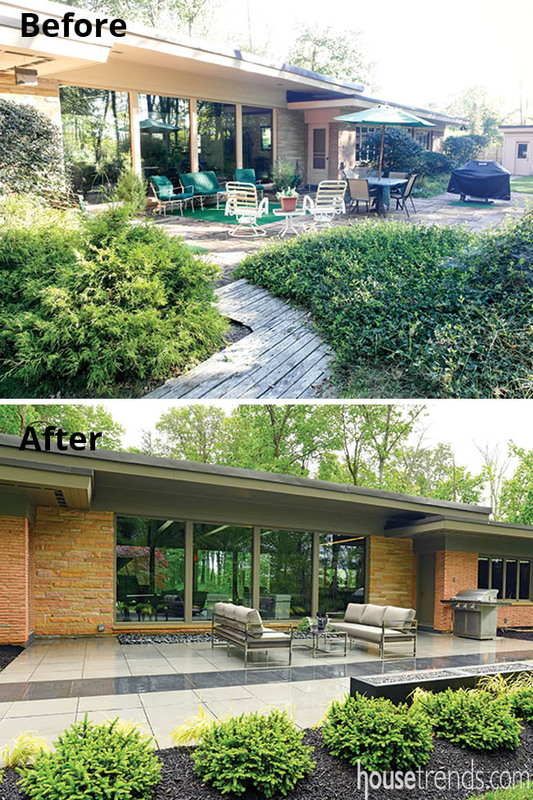 The great outdoors at the house received a significant transformation from designer Dwight Goodin of Paver Planet and work by Todd George and Drew Parramore of Ohio Green Works. 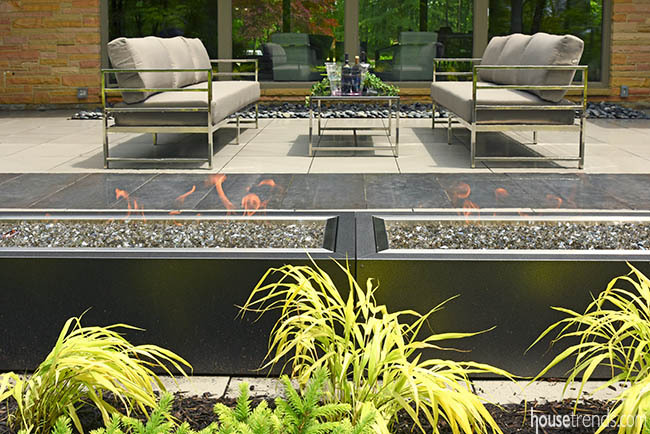 Because Jeff is the owner of Centerville Home Fireplace and Patio, choosing the perfect outdoor furniture, fireplace and accessories was easy. 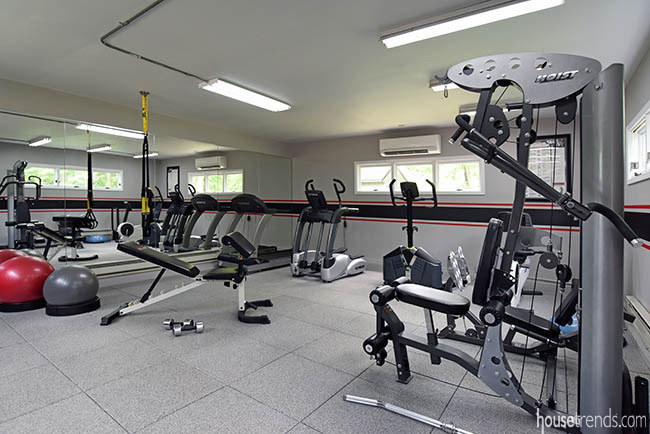 An outbuilding, which once served as an artist studio, is now a fitness center for the homeowners. Jeff and Faye have a genuine love for the home they had long admired. “From pulling into our driveway to sitting in the great room relaxing with a glass of wine, we get constant enjoyment from this house,” says Faye.